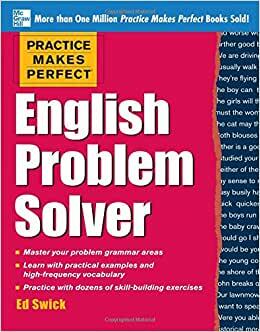 Practice Makes Perfect: English Problem Solver doesn't pretend that learning English is easy. Instead of covering the entirety of the language, it hones in on those areas where you might have difficulty--areas such as definite vs. indefinite articles, little vs. few, using get, and restrictive and non-restrictive relative clauses. Don't sweat those troublesome grammar areas any more! Practice Makes Perfect: English Problem Solver is your perfect learning tool for ironing out your troubles. Start reading Practice Makes Perfect English Problem Solver on your Kindle in under a minute.